borough and Lakeville, historical personages are noted in passing with a quick sentence or brief notice before being passed over for the next topic. One such person was Dr. Charles W. Leach, a resident of Lakeville who practiced dentistry in Middleborough during the mid-19th century. The cursory notice in Romaine's History of the Town of Middleboro, Massachusetts never hints at the true tragedy of his life. Leach first established his dental practice in Middleborough in 1853, coming from Boston, while in his twenties. At the time, the Namasket Gazette reported that "a recommendation from his former business place in Boston, ... represents him as skillful and ingenious in his profesion." In November, 1853, it was reported that Leach was "receiving calls from those in want of Dental operations, in such numbers that he feels encouraged in his determination to establish a permanent office here." Leach ultimately took over the practice of Dr. J. T. Harris, a dentist and homeopathic physician, who kept an office over Levi P. Thatcher's jewelry store in Middleborough on Tuesdays, Thursdays and Saturdays. By 1859, Leach was advertising a new office in the Doane and Shaw building on South Main Street, and he later removed next door, to the American Building, with offices above Miss Barrows' millinery store. The establishment of a Middleborough practice allowed Leach to become a prominent professional man in the community. He took an active role in town organizations as a member of the Central Baptist Church and the Sons of Temperance. In 1859, he took part, alongside other local businesses, in the July 4th parade: "Then came the Dentist, Dr. C. W. Leach, on wheels, looking very attractive, and making one believe that it was nothing to have a tooth pulled. Did his patient think so?" 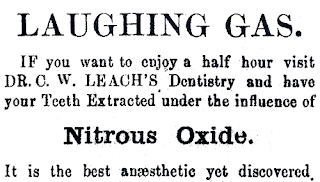 Regardless of what his patient thought, painless dentistry was a goal of Leach who pursued the latest developments in the field including the application of electricity in the extraction of teeth, and the use of nitrous oxide (laughing gas) which Leach advertised as "the best anaesthetic yet discovered....If you want to enjoy a half hour, visit Dr. C. W. Leach's Dentistry and have your Teeth Extracted under the influence of Nitrous Oxide." On Christmas Day, 1860, Leach married Rebecca L. Jenney at Middleborough and by 1864, he was settled enough in his practice to purchase the large Job Peirce House on the corner of Main and Vaughan Streets in Lakeville where he made his home until 1872, and he was professionally successful enough to be able to hire an assistant, Edward S. Hathaway of Middleborough, during this same period. In late 1869 and early 1870, Leach was elected a Masonic officer as well as officer of the Assawampsett Division, No. 34, Sons of Temperance, and in February, 1870, extended his dental office "by an addition of two rooms and thus changes are continually surprising us." "Dr. Charles W. Leach, a well-known dentist residing at the Four Corners, Lakeville, a member of the Baptist church and of the Sons of Temperance, has been drinking very freely for a week, until on Friday he became perfectly crazed with alcohol. On that Friday afternoon Dr. Leach told his family to go away into a room by themselves and stay, for either the Lord or the Devil was coming to see him. He then took his eldest boy [Charles W. Leach, Jr.], a bright little fellow about ten years old, into the front room, where he had a double-barrelled shotgun and a stock of ammunition. The doctor then stationed himself by an open window, where he lay in wait for victims." Leach ultimately shot and wounded Thomas Bump, who boarded in his house, and neighbors John Capeless, William Coombs and Daniel Swift. Eventually, Bump, Coombs, Swift and Andrew M. Shockley were able to overwhelm and capture Leach. "During all this time the doctor's little boy was forced to hand the powder and shot to his father, who threatened to kill him if he did not do it." Leach was held overnight at Middleborough, where the following morning Judge of Probate William H. Wood ordered his committal to the Taunton Lunatic Asylum, Doctors William W. Comstock and Ebenezer W. Drake signing the certificate stating that Leach was insane through the use of alcohol. Characteristically, naysayers appeared immediately following the incident to denounce the previously unassailable Leach. "Although a good dentist, he is said to be a man of considerable temper, mixed with not a little cruelty, and hard stories are told of his treatment of his family", sniped one local newspaper. Committal to the Taunton Lunatic Asylum (as then not yet euphemistically known as the "State Hospital") must certainly have been a grim experience. Opened in April, 1854, with accommodations for 250 patients, by 1872, the asylum was noted for overcrowding and increasingly deplorable conditions. It was reported that upon entering the institution, Leach "settled into a dumb, stupid state, taking no notice of anything nor any person. Does not care to leave his room, read books or papers, go to bed or get up. Those who have doubted Dr. Godding's statements as to his mental condition should call at the asylum." Meanwhile, legal proceedings were taken. William H. Wood was appointed guardian of Leach, and Leach's victims sought to settle their claims for damages, "but the friends of the assailant decline to compromise." Leach's one-time assistant, Edward S. Hathaway, by this time a full-fledged dentist in his own right, assumed Leach's practice. In March, 1873, Leach came near to being released from the asylum, "but at the time for his leave-taking approached he became violent again" and his release was not approved. Ultimately, Leach was released in early January, 1875. "Dr. Charles W. Leach was discharged from Taunton Asylum last week by the board of trustees, and taken by his friends to Sunderland", Massachusetts. Little is known of the later history of Dr. Leach or his family, it having been obscured by the stigma which attached itself to the tragic incident at the time, itself a reflection of society's equally tragic misunderstanding of the causes and treatment of mental illness. At Sunderland Leach initially engaged in farming, residing with his wife and four children, though in time, he appears to have returned to dentistry. In June, 1900 (his wife having died in the meantime), he was residing with his sister and brother-in-law at Sunderland, and was listed as a dentist. 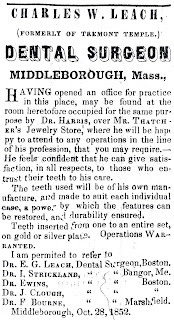 "C. W. Leach, Dental Surgeon", advertisement, Namasket Gazette, May 15, 1858. "Laughing Gas. ", advertisement, Middleboro Gazette, May 28, 1864, page 4. United States Federal Census, 1880, Sunderland, Massachusetts, Enumeration District 261, page 17, and 1900, Sunderland, Massachusetts, Enumeration District No. 498, page 97.